“Well, you can tell by the way I use my walk / I’m a woman’s man, no time to talk.” Those opening lyrics sung by the Bee Gees set the tone for a classic film as well as the career that it launched. John Travolta was already a beloved heartthrob widely known for his scene-stealing role as Vinnie “Up Your Nose With The Rubber Hose” Barbarino on “Welcome Back, Kotter,” not to mention a couple memorable appearances on “American Bandstand.” Yet it was his portrayal of Tony Manero in 1977’s “Saturday Night Fever”—starting with that unforgettable pan up his body as he strutted toward the camera to the rhythm of the Bee Gees’ “Stayin’ Alive”—that earned him cinematic immortality along with a well-deserved Oscar nomination. What made Travolta’s performance so mesmerizing was not only his iconic dance moves but the restlessness and anxiety that fueled his nights on the disco floor. Over the past four decades, Travolta has added several more cherished characters to his resume—Danny Zuko in “Grease,” Vincent Vega in “Pulp Fiction,” Chili Palmer in “Get Shorty,” Governor Jack Stanton in “Primary Colors,” Edna Turnblad in “Hairspray,” and more recently, lawyer Robert Shapiro on FX’s “American Crime Story: The People v. O.J. Simpson,” a role that earned Travolta Emmy and Golden Globe nominations. His latest big screen vehicle is Kevin Connolly’s “Gotti,” a biopic featuring Travolta as the notorious crime boss John Gotti, whose acts of brutality are juxtaposed with his legacy as a principled family man. There’s a workmanlike nature to his crimes, suggesting that Gotti derived little pleasure from committing them, apart from the satisfaction of fulfilling his responsibilities. His story is told in nonlinear flashbacks threaded together by a pivotal conversation between him and his son, John Gotti Jr. (Spencer Lofranco), in prison. Two years ago, a gorgeous print of “Blow Out” screened at Ebertfest with Nancy Allen in attendance. It was a film that Roger Ebert interviewed you about in 1981. You discussed with Roger “the magic of being able to relate” to Nancy onset, enabling your relationship as actors to inform your relationship as characters. Is that something you strive to have with your co-stars on every project? It’s always helpful if you have a good communication with your co-star. The better that communication is, the better chance you have of pulling it off together. People say that chemistry is an innate thing, but it’s true that it can also be created. If I ask the right questions of you, and you ask the right questions of me, I can assure you, we’ll start looking good together. You know what I mean? Like buddies. You can do the same thing with acting. 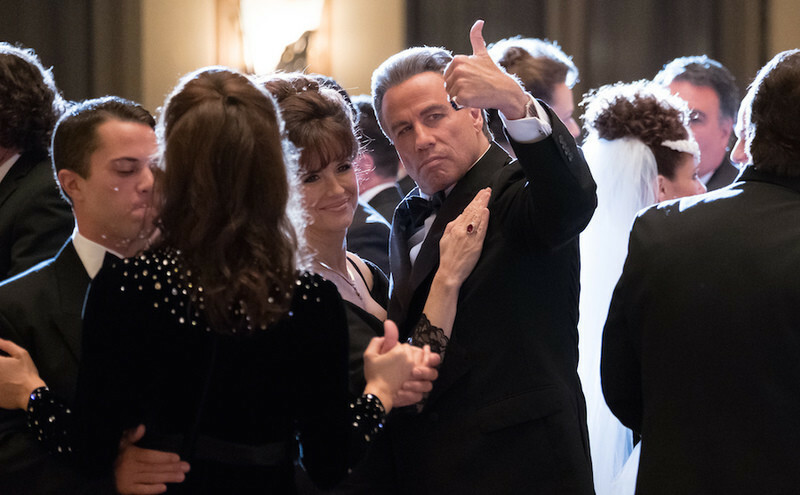 Kelly Preston and John Travolta in “Gotti.” Photo credit: Brian Douglas. To what extent did your and Kelly Preston’s relationship inform your approach to portraying John and Victoria Gotti, respectively? Using the marriage as a comfort zone is a given. I know how to be comfortable with my wife, and she knows how to be comfortable with me. But figuring out how to be comfortable as John Gotti Sr. and Victoria Gotti is where the fun begins. The journey of being other people requires you to understand how they experience things, and in some cases, it might be similar to your own experiences. When you do all your research, you discover how to play these characters, and then you discover how they’re going to interplay. That’s much more of a challenge than just riding a wave. From the beginning, you have been gifted at making characters charismatic without sugarcoating their faults. Billy Nolan in “Carrie” is abusive but also a goofball. You fought against sentimentalizing Tony Manero in “Saturday Night Fever,” which is part of what makes that film so great. 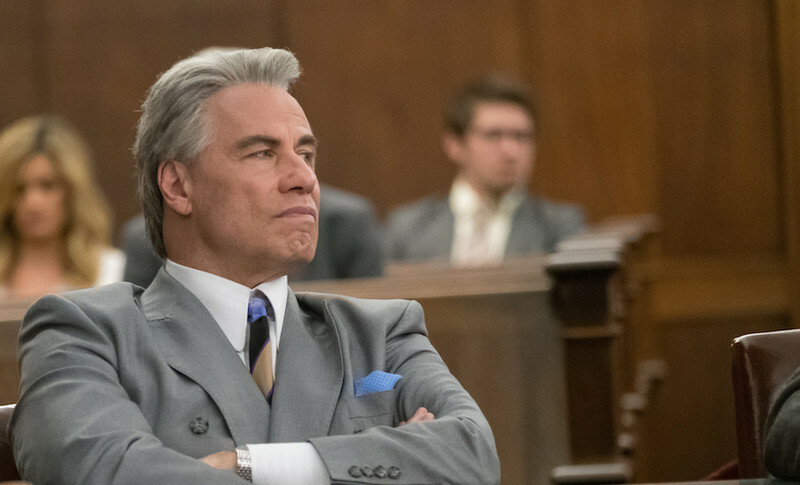 How challenging was it to find the charm in John Gotti? Small businesses were suffering at that time, and he financed big celebrations for the neighborhoods where they were located. There were times when people had medical issues and Gotti would help them. In the movie, we depict a boxer who had given up his career because the gym closed. Gotti reopens it. These are reasons why he was loved. Also, I think it was clear that he was a family man who really adored his kids, and I needed to know more about that. All of those things informed me at a level of understanding him better, and they enabled me to portray his charisma or charm a lot better because I understood the balance—that duality or dichotomy. You see that side of him when he charms a roomful of peers with a joke before easing his way into a new place of power. 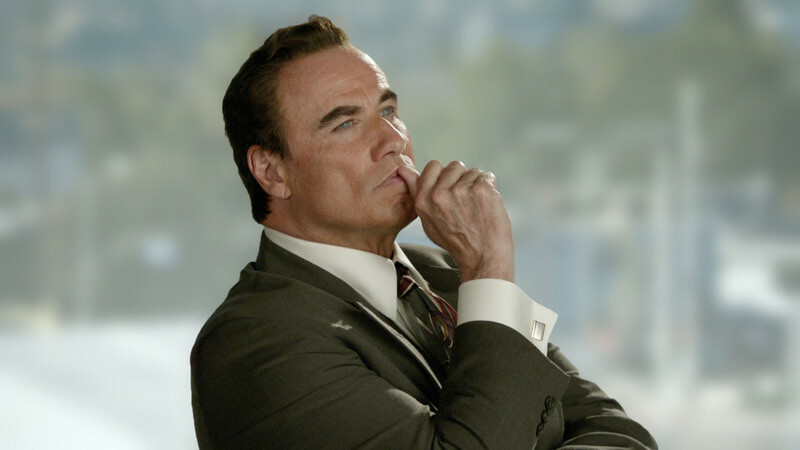 John Travolta as Robert Shapiro on “American Crime Story: The People v. O.J. Simpson.” Photo courtesy of FX. This project has spanned numerous years, all the while maintaining the support of Gotti’s family, particularly John Gotti Jr.
We had six or seven years to discover how we wanted to tell this story. Every script that we got was rewritten, every cast that we got was recast, and every director we got was replaced. It endured a history of change that was unusual for a film. We may have had more chapters than any other movie. The only good news is that sometimes the best movies are ones that you have to be patient with like “Cuckoo’s Nest” and “Forrest Gump,” which both took around a decade to make. Sometimes you wait for something good, and we did. But the journey was wonderful because the family was so involved. They gave me John Gotti’s personal effects and they gave Kelly Victoria’s personal effects. They gave insight into their father/husband that nobody else could give you. I saw home movie footage that was so informative in terms of behavior, which is what I’m all about as an actor. I love observing behavior, and you can only capture it by watching the real deal. I wouldn’t guess at how a real-life character would [glances at my glasses and list of questions] put his glasses on or the way he would move his paper on a table. I wasn’t guessing at what Gotti did, I saw him do it with my own eyes. When I played Shapiro in “People v. O.J. Simpson,” it was all about behavior with him too [in Shapiro voice] because he was a snob. His physicality and how I articulated his lines defined him and informed the audience that they were in the presence of royalty. When you deal with Shapiro, you’re not just dealing with a lawyer, you’re dealing with the royal lawyer, and that comes across in his affected voice and demeanor. He used those characteristics in the way that an actor would use them. Those bits of behavior are tools that invite the audience to get very comfortable with my characters. Look at Vincent Vega in “Pulp Fiction.” So much of what one enjoyed about that character was watching how he behaved. [in Vega voice] His speech was slower, his shoulders were slumped when he ate, he rolled his cigarette and lit it in a certain way, and it looked as if he were sauntering through mud to get to a door. That behavior even informed Vincent’s dancing. There’s a certain humor about not only Robert Shapiro, but another of your finest recent roles, The Marshal in Ti West’s “In a Valley of Violence.” Both characters are tough men who gradually find their power taken from them. How do you go about gauging the comedic aspects of these men without turning them into caricatures? What makes people—I don’t want to say laugh at you or even laugh with you…but when you observe a person and they have antics that are peculiar or absurd, they are funny in a way that comes naturally. When you play a person like that, you can be funny without looking like you’re trying to be funny. There’s a scene where Shapiro marches into O.J.’s room and says, [in Shapiro voice] “Okay, you woke up—You were upset. You slashed the tires in anger.” I read that scene and thought, “Who would say that?” [laughs] He’s like an acting teacher describing some scenario, and the other lawyers are looking at him like the audience is. They’re like, “Are you for real?” It’s so eccentric, and it’s the eccentricity that made him funny. You weren’t laughing at him so much as you were laughing at the absurdity of his behavior. With his wooden leg. The humor there spawned from that question of, “What do you do with a son that’s a complete monster?” My character tries to love his son, but this kid just destroys everybody’s life at will. A situation like that inspires a certain type of eccentric behavior that anyone would find funny or enjoyable to watch. You’ve said in the past that you wished “Grease” had been shot in Chicago, the place where the musical originated. Would that location change have enhanced the film in any way? Well, to me, the era of the school where we shot is really meant to represent Anytown, USA. I was referring more to the spirit of the movie because it was created here by Jim Jacobs and Warren Casey. I knew that there’s a Chicago edge to the play that is much different from the movie. The play had a lot more of that edge. The character of Sonny, for instance, was played very sleazy and was a little more gangster than greaser. The movie didn’t take the fun of that away, but it did remove the grit of the play, which was inspired directly from the Chicago suburbia. Danny and his friends in the play were a little bit more reflective of the real greasers that I grew up with in New Jersey and New York. They were slightly darker characters, which made them funny in a different way. In the movie, it was a little lighter fare, and maybe Jeff [Conaway] and I had a bit of gravity, but that was true of all the characters in the play, which was very specific to Chicago and New York. My brother was a greaser and his friends were serious greasers, and in those days, the greasers were heading to prison. They’d have knife fights in the basement that would end with someone getting thrown through a wall. The arrival of the police was a normal occurrence. The film wouldn’t have been embraced as family-friendly entertainment if it had gone that route. I was surprised to learn that your first official film credit was 1975’s “The Devil’s Rain,” a horror film about a sinister cult that featured a cast of big names, including my cousin Eddie Albert. Was there anything you learned during that first film set experience that you carried through the rest of your career? Okay, so I’m 20 years old, I’m in Mexico, and I’m surrounded by every big movie star that I grew up with—Ernest Borgnine from “Marty,” Ida Lupino from the noir films and Eddie Albert, who I loved—and we’re all in a horror picture. All I could think was, “Am I dreaming? How did this happen?” Tom Skerritt and Joanie Prather were in that too. It was a crazy cast, but I kind of just rode the wave because I had nothing to do in it. I had one line: “Blasphemy! Get him! He’s a blasphemer!” And then I melted. [laughs] I was really more of makeup dummy than I was hired to do a role. But there’s a great story behind that. Lynn Stalmaster was the casting director who tried to put me in “The Last Detail.” It was between me and Randy Quaid for the role of Meadows. I had screen-tested twice and they loved me for the role, but they felt Randy was closer to the actual character. Lynn didn’t want me to leave Hollywood. I was going back to Broadway to do “The Ritz,” and he said, “I will get you a job that will pay $800 a week for five weeks. Will that keep you here?” And I said, “Yeah, I can afford to stay if you do that.” So he did, and he added, “While you’re gone, I’m going to get another job lined up for you. Stay out west.” And the job he got lined up was “Welcome Back, Kotter.” Before that, I had to take this strange job on “The Devil’s Rain,” but two things happened because of it: I got to be involved with a lot of movie stars that I grew up with, and I got introduced to Scientology there by Joanie Prather. My life changed after that. It was totally serendipitous.